After centuries of conflict between the Red and Blue mushrooms, you've discovered the last piece of ground on the desolated earth that has not been covered with mushrooms and spores. GET TO WORK! SHOW THAT YOUR COLORS REIGN SUPREME! 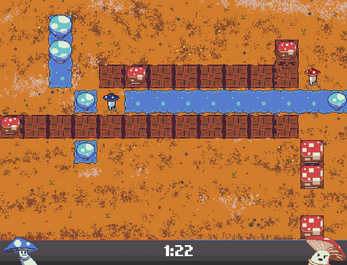 Your goal is to have as much of the ground covered with your colored spores before the end of the 2 minute timer. Hold left: Plant a mushroom to the left of your character. Hold right: Plant a mushroom to the right of your character. Hold up: Plant a mushroom above your character. 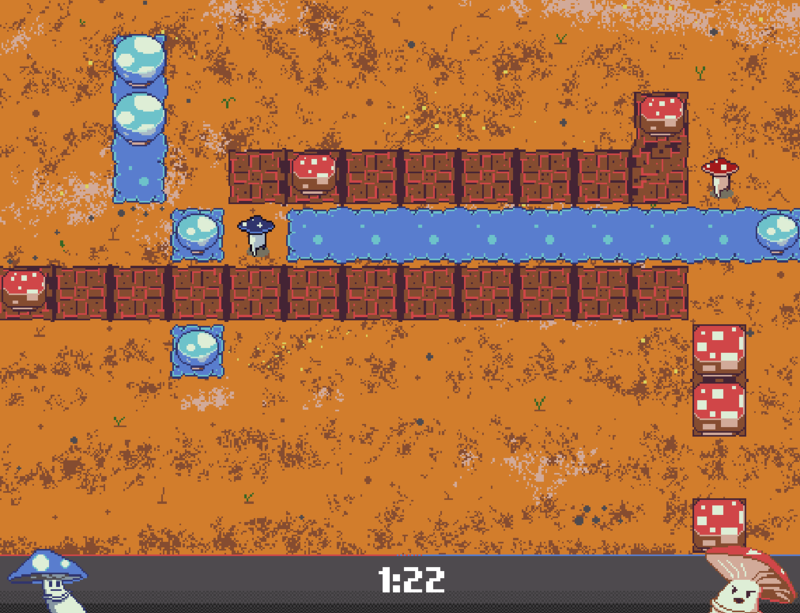 Hold down: Plant a mushroom below your character. Hold A: Plant a mushroom to the left of your character. Hold D: Plant a mushroom to the right of your character. Hold W: Plant a mushroom above your character. Hold S: Plant a mushroom below your character. SMALL - this mushroom is useless, because it's so tiny. You can destroy this mushroom (if it's your mushroom) by moving towards it. It will disappear. 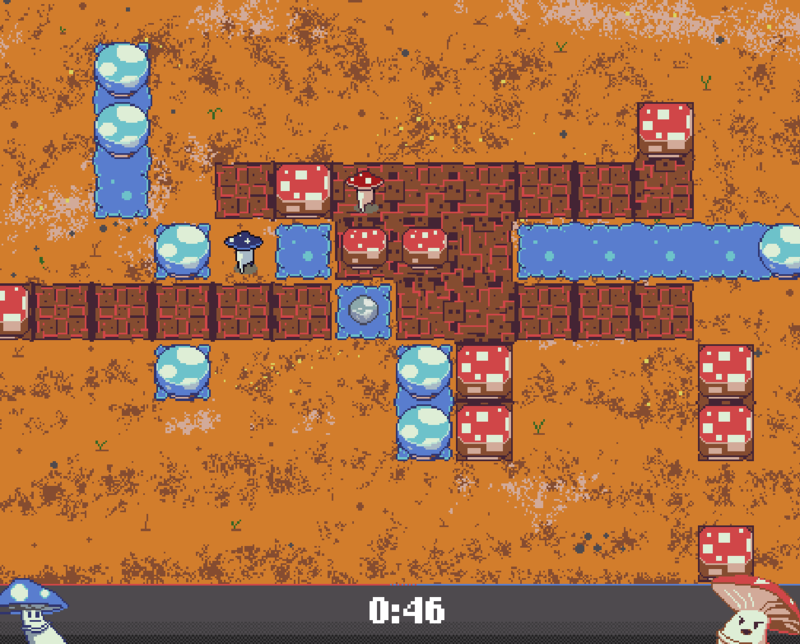 MEDIUM - if you move towards this mushroom, you will disappear and send spores flying across the ground in a straight line, converting and ground they cross into your color, and planting a new mushroom when they come to rest. 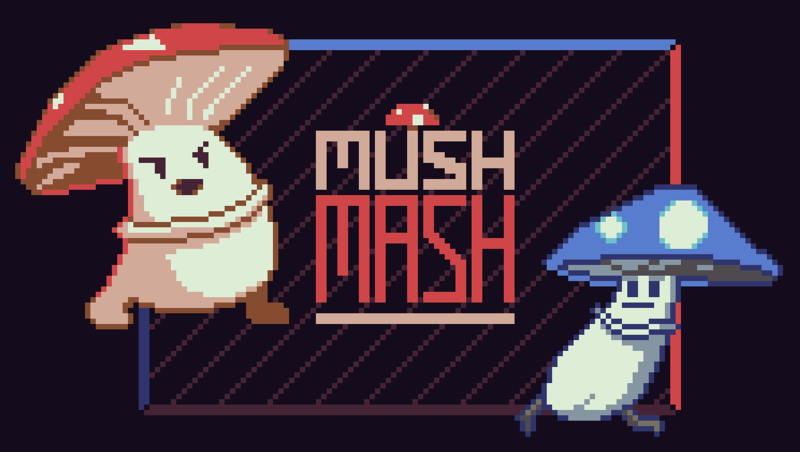 They can be stopped by colliding with a player, another mushroom, or a wall. LARGE: These mushrooms are permanent, and lock the ground beneath them into your color. Whenever you grow a large mushroom, it's an obstacle, and one permanent point for you. If one of your small or medium mushrooms start turning grey, this means that the mushroom is dying. This is happening because there is not enough of your territory surrounding the mushroom. Convert territory around these mushrooms to your color to save them! Large mushrooms are immune to dying. Going after your opponent's mushrooms involves converting land around them, making them die. If one of your opponent's flying spores hit you, you will stop it in its tracks, but you will be stunned for a moment or two, as indicated by a spinning icon. Cover the ground with the colored spores of your choice. Good luck!